Next week starts Julia's Spring Vacation. I'm trying as hard as I can to get a lot of things accomplished before I get distracted. The past week and few days, I've been working on painting one of the bedrooms in order to get it ready for some playing with pattern. Working on my new book Crafting A Patterned Home has been challenging. I feel like I said almost all I had to say about interiors and handmade things in the last book Crafting A Colorful Home. Now I'm trying to find places to add pattern that are NEW to our home because who will want to read another book by me if it is all a repeat. Our home is pretty covered in pattern already. I am changing some wall colors and starting fresh. I forgot how long it takes to paint a room. It would be much easier if there wasn't furniture, bookcases, beds and the things of life. No wonder no one re-decorates very often. It would be much easier if I could afford to hire a painter but I can't so I'm doing it myself. This morning I knocked an entire almost full quart of semi-gloss trim paint off the top of the ladder onto the floor. Bummer for sure. What a mess. Thank goodness there was a drop cloth there but it still managed to get on other stuff. Sometimes I just move too fast without thinking. Must watch that. Tomorrow our sheep shearers Kevin Ford and Gwen Hinman are coming to shear 100 sheep. We planned to do all 200 plus sheep over two days but the weather isn't cooperating. 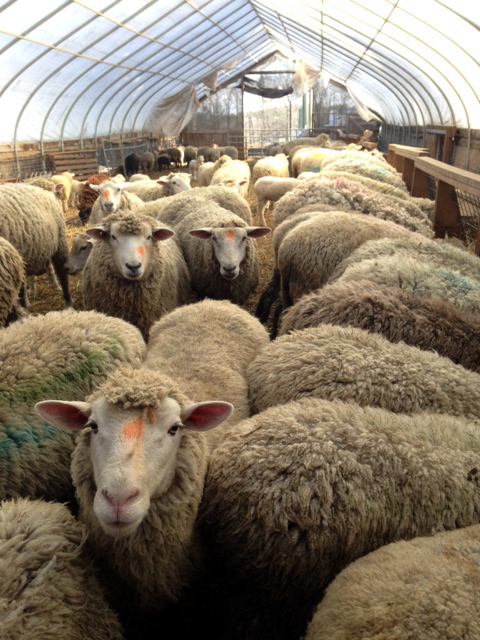 Only 100 adult ewes fit into the greenhouse on Monday and the rest are soaked because of two days of rain. Wet sheep cannot be sheared. We will have to re-schedule and then hope for the best but at least a bunch of sheep will be clipped. After that, the sheared sheep can move on out to the pastures for grazing once the grass begins to grow. We've had pretty cold weather lately so growing is definitely stalled. That could change quickly. Last night was the official weaning night for the lambs of these 100 ewes. Thank goodness our house is 5 miles from our barns. It was very noisy, for sure. The striped marking system of colors on the ewes and lambs painted at lambing helped identify which ewes had lambed when. Any ewe with a blue or green stripe had an old enough lamb(s) that would be able to survive without mother's milk. Those are the ewes that are being sheared. The spray paint we use is scourable so if the wool is decent when it comes off the sheep, we may be able to sell it for further processing. First of all, I had a career in the yarn business and I know how hard it is to sell yarn and make money doing it. I worked (for someone else) for 16 years and I don't have the interest to market our wool. Right now, in my life, I am more interested in design and color. I know how much work it is and also the amount of money earned for effort really wouldn't be worth my time. ("Been there, done that." "Life is too short.") For our farm, we have to choose where to spend the limited dollars we have. We also don't have warehouse space and I'm not looking for my living room to become a wool warehouse. I remember years and years ago when I first became interested in raising sheep, I thought there would be money in wool. Mark told me the money would be in the meat and I didn't want to believe him. It only took me a couple years to figure out that he was right. He is a smart farmer. He always has been a realist and he is a good complement to my sometimes "out there" dreams. The Farmers Market Season opens next week. The first market in Amherst on the Common in April 23rd (Mark's market). First market for the Tuesday Northampton Market (my market) is April 26th. We both look forward to seeing our customers in Northampton and Amherst again after a winter's break. It really is quite a nice feeling to have customers who love our farm raised meat and who feed their families with it. It's a bit of a throw-back to when people actually knew the animals they consumed - only now, some people know the farmers who care for their animals and meat and give them good lives and make their protein available to consumers. Quite a different feeling as opposed to buying your "meat" off a styrofoam plate raised who knows where and who knows how wrapped in plastic from a grocery store. There are some great developments at all the markets in western Massachusetts. CISA has done fundraising so that people who have SNAP benefits will double their money. The limit right now is $5 which will turn into spending $10 at the local markets. This makes Buying Local more affordable to many people who rely on SNAP benefits. It gives people the chance to support our farm by buying local meat. I think this is a program which will be growing over the upcoming years. It is nice that we here in the Western MASS Farmers Markets and farm economy are being trendsetters and perhaps it is a trend that will go nationwide. 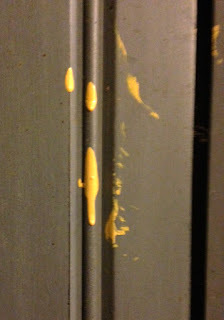 OMG...my worst paint nightmare. Painted my entire three-story house myself 15 years ago, and now it's time to paint again if we want to sell. I am quite sure your spilled paint scenario is in my future. LOVE the SNAP news! Such wisdom. Good luck with shearing! Have had the SAME paint for the last 25+ years! - Way TOO much STUFF in front of it all! And, considering that my Maternal Grandfather was a House Painter, a bit embarassing I suppose... Although, my Sister more than makes up for it. She's constantly "redoing" some wall every few MONTHS! Whilst I just wish I had walls to put "PAINTINGS" on! I remember spilling paint at our first house over twenty years ago, an experience I'll never forget, ugh. Farming does require going beyond your dreams and into the practical stuff that will actually help you earn a living.